These rough-and-tumble cargo pants will hold lots of tools and important toys for all the exciting adventures headed your way. In addition to the large cargo pockets at the side seams, the pants include back patch pockets and convenient front pockets. The articulated knees and pieced back and front panels give ample opportunity to add topstitching for rugged style. Add the simple knit raglan T-shirt with a chest pocket to complete the outfit. 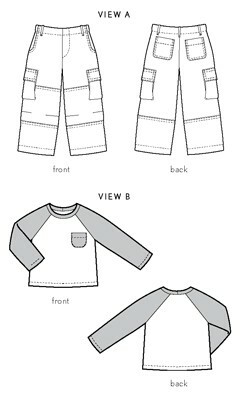 After successfully sewing this pattern, you will have developed the following skills: front hip pocket, knit fabric, patch pockets, and raglan sleeves. Cargo Pants: Light- to medium-weight woven fabrics like quilting cotton, broadcloth, chambray, denim, fine-wale corduroy, poplin, and linen. T-Shirt: Light- to medium-weight knits with at least 25% stretch. Cargo Pants: Coordinating thread, 1 yard 3/4" elastic, one 5/8” button (optional). Pants, Waist* 21" 22" 23" 24" 25" 26"
Pants, Outseam 16 3/4" 17 3/4" 18 1/2" 19 1/2" 21" 23 1/4"
Pants, Inseam 11 1/4" 12" 12 1/2" 12 3/4" 14" 16"
Shirt, Chest 21 1/4" 22 1/4" 23 1/4" 24 1/4" 25 1/4" 26 1/4"
Shirt, Sleeve** 12 1/2" 13" 13 3/4" 14 1/2" 15 1/4" 16 1/2"
Shirt, Length** 10 3/4" 11 1/2" 12" 12 3/4" 13 1/4" 14 1/4"
Pants, Waist* 27" 28" 29 1/2" 30 1/2" 32" 33"
Pants, Outseam 25 1/2" 27 1/2" 30" 31 3/4" 33 1/2" 35 1/4"
Pants, Inseam 17 3/4" 19 3/4" 20 1/4" 21 1/2" 22 3/4" 24"
Shirt, Chest 27 1/4" 28 1/4" 29 3/4" 30 3/4" 32 1/4" 33 1/4"
Shirt, Sleeve** 17 1/2" 18 1/2" 19 1/2" 21 1/2" 22 3/4" 24 1/4"
Shirt, Length** 15 1/4" 16 1/4" 17 1/4" 18 3/4" 20 1/4" 21 3/4"